I visited Rishikesh and saw mother Ganga flowing in her pristine form. That was my first sight of my most revered, most beloved and most enigmatic mother Ganga flowingly quietly along the serene and gorgeous gorges along the foothills of Himalayan range in Rishikesh. I was overtaken by deep emotions and nearly wept at the sight of Ganga. There will not be a single Indian who doesn’t feel the same way I felt at the very first sight of this holiest of the holy rivers. It strikes a deep raw chord in us and we lovingly get ourselves swept away by its spiritual grandeur. Our lives are filled with stories of the role Mother Ganga played in the lives of great souls that traversed on this holy land. From Sage Bhagirath to King Santanu and from most revered Adi Sankara to Kalidasa. I find it spiritually very chilling to note that this is the same holy river water that poured out from the Lotus Feet of Lord Vishnu, descended on Lord Shiva’s braids and finally landed on mother earth to become the chief motivator of an entire religion for thousands of years. Generations of our rishis, poets and kings were inspired by this river and its vast spiritual significance. The quintessential hero of Hinduism Sri Adisankara wrote an ashTakam (octet) and a stotram. Sage Valmiki, author of Ramayana, and Kalidasa, the greatest poet ever produced by India, wrote an ashTakam each. There is also a reference to Ganga Sthavam from Kalki Purana. Every river in India is connected to river Ganges in some form or the other, if not through the several rounds of hydrological cycle that it experiences, by the very connections established from our holy books. A Hindu invokes the name of mother Ganga through a daily chant before taking a bath. This is one simple mantra that at once invokes a strong connection of all the holy rivers in India with mother Ganga. Hey Ganga, why would there be any pains of hell to those whose eyes see at least one of your waves? Hey Ganga, permanent residence in Vaikunta is assured to anyone who consumes even a sip of your water. 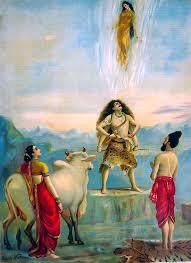 Oh, mother, to any being who takes a dip in your holy waters, even the post of Indra become worthless. Some trivia about the spiritual significance of Mother Ganga in Hindu religious context. During the early Vedic Age of the Rigveda, the Indus and the Sarasvati River were the major sacred rivers, not the Ganges although there is a mention of Ganga in one of the rare verses in Rigveda. But the later three Vedas give much more importance to the Ganges. Kumbh Mela is a mass Hindu pilgrimage in which Hindus gather at the Ganges river. The normal Kumbh Mela is celebrated every 3 years, the Ardh Kumbh is celebrated every 6 years, the Purna Kumbh takes place every 12 years and the Maha Kumbh Mela comes after 12 ‘Purna Kumbh Melas’, or 144 years. Ganges is the third largest in terms of discharge. Worship of mother Ganga does not require the usual rites of invocation (avahana) at the beginning and dismissal (visarjana) at the end, required in the worship of other gods. If the above control does not work, click here. This song may also be viewed using on YouTube. In late October, about an year ago, I visited Rishikesh and experienced the immense beauty and permanence of perpetual spiritual energy of Mother Ganges. She is our eternal mother who sustained us spiritually over many births, including this one. We may have some understanding of our deeply buried longing to see her which comes out gushing as soon as we see her. We know that she knows us and remembers us but we will never know her longing to see us again and again. Whenever we visit our mother especially after several years, and may be after several births, it goes without saying that we should take something with us as a gift to our mother. What I decided to give my mother is a topic for another post. After reading this post, my wish to visit holy river Ganga has increased. Eagerly waiting for Your new post….Thank You. Mother Ganga ! our own Mother Divine ! Mother to all ! Namaami Gange Tava Paada pankajam, Suraasurer vandita divya roopam ! I have always felt overwhelmed at Her sight. Her very thought makes me emotional. O Mother ! please call me back to you. The one thing that hurts me is people calling Her Ganges. Why should we submit to the convenience (of pronounciatio ) of others and distort the most beautiful name : G A N G A ! I remember one evening when I was sitting on Her banks, in Rishikesh, listening to Her divine music. I was full of joy, J O Y ! My attention was drawn to a hushed conversation beside me. I looked to the side from where the talkings came. A young Europian couple smilingly responded to my gaze. They sat beside me. I asked them if they knew this river. ” Ganges ! “, they responded. I said ‘ No it is not Ganges. We dont have any river by name Ganges.’. Curious about my utterings, they looked at me with a questening look. It is Ganga, not Ganges, I said. They said that they have always been taught it to be Ganges. They never knew the name Ganga. ‘GANGA, we will correct ourselves now, They even found the name Ganga musical ! The couple assured me that when they get back home, they will tell their people about GANGA. We spent more than an hour on that sacred banks, hardly speaking, quitely listening to the music emanating from Mother Ganga. It was emotional, reading your blog. May Mother Ganga’s Grace and Blessings always be with you. Previous post: Was I fully prepared before returning?